A local village, Navatkadu, has been recognized by the local authority as impoverished, with families living under the poverty line and children having difficulties without proper access to education. We were informed about an existing multi-purpose building in the village that was originally built for the benefit of the people, but which was expropriated for military use during the war and used as a military camp until very recently. The building has now been released by the military and is now available for its original purpose of providing social service activities for the community. The intention is to set up a pre-school in the building for children aged between 3-5 years and to open it up in the evening for Grade 11 children to study mathematics, English and science. 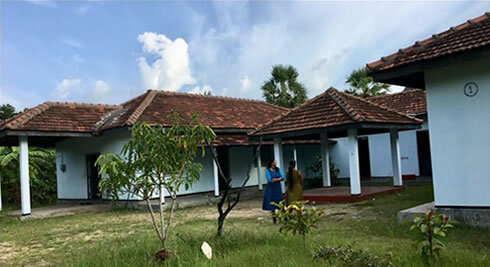 The building is a large structure consisting of several rooms and can accommodate other activities such as vocational training and other programmes to help build up employment skills for the poor in Navaktadu. We have agreed to pay for the repair work to the building and for the various furniture and fittings that are required to equip it to commence its pre and post- school activities (total cost c£1200). We have also agreed to meet the monthly costs of the pre-school and specialist mathematics, English and science teachers at a cost of c£125 per month. The village, of Navatkadu, close to Akkaraipattu, has been recognized by the local authority as impoverished, with families living under the poverty line and children having difficulties with proper access to education. HELP was informed in late 2017 about an existing multi-purpose building in the village that was originally built for the benefit of the people, but which was expropriated for military use during the war and used as a military camp until very recently. The building has since been released by the military and is available for its original purpose of providing social service activities for the community. The intention is to set up a pre-school in the building for children aged between 3-5 years and to open it up in the evening for Grade 11 children to study mathematics, English and science. The building is a large structure consisting of several rooms and can accommodate other activities such as vocational training and other programmes to help build up employment skills for the poor in Navaktadu. HELP financed the necessary repair work to the building and for the various furniture and fittings that were required to equip it to commence its pre and post- school activities. We also meet the monthly costs of the pre-school and specialist mathematics, English and science teachers at a cost of c£125 per month.